Shelter Box Appeal for Pakistan. The Rotary Club of Drogheda would like to thank all those who contributed to their ShelterBoxes for Pakistan Appeal held on two week-ends in October. The collection effort was a big success and a total of Euro 2247 was collected between locations at Tesco 24 Hour and Scotch Hall. The Rotary Club would like to sincerely thank all those at Tesco and Scotch Hall who helped and supported the fund raiser as well as all those Rotarians and their family members and friends who helped with the collections on the two Saturdays. Tom Eustace, Shelley Allen and Cyril Bellew at the collection point in Scotch Hall. ShelterBoxes are shipped to crisis parts of the world where there are earthquakes, floods and conflicts which have uprooted people from their homes and villages and that have turned normal living into a dire struggle to survive. Current crisis points are the floods in Pakistan, floods in Niger and the floods and mudslides in Guatemala. Over 2500 Shelterboxes have been shipped to Pakistan in the last two months as well as 5,000 water filtration units and 2,500 water carriers in response to the need for clean water. 1,290 tents have been set up in eight camps in Pakistan since Thursday, September 2. Each Shelter Box contains a 10-person tent designed to withstand extreme temperatures, high winds and heavy rainfall. In addition to the tent, there is a range of other survival equipment including thermal blankets and insulated ground sheets, essential in areas where temperatures plummet at nightfall. Where malaria is prevalent mosquito nets are supplied, as well as a life saving means of water purification. Water supplies often become contaminated after a major disaster, as infrastructure and sanitation systems are often destroyed. A family-sized water filtration unit or LifeStraw can filter a minimum of 18,000 litres of water – providing safe and potentially life-saving drinking water for displaced families. A multi-fuel stove is also supplied which can burn anything from diesel to old paint. This provides the heart of the new home where water is boiled, food is cooked and families congregate. In addition, there are pans, utensils, bowls, mugs and water storage containers. A basic tool kit containing a hammer, axe, saw, trenching shovel, hoe head, pliers and wire cutters enables people to improve their immediate environment, by chopping firewood or digging a latrine, for example. Then, when it is possible, they can start repairing or rebuilding the home they were forced to leave. ShelterBox was founded by Tom Henderson, a Rotarian and former Royal Navy search and rescue diver. Rotarian support currently contributes an estimated 50% of ShelterBox donations. Around 5,000 Rotary clubs worldwide have supported ShelterBox since it was launched in 1999. 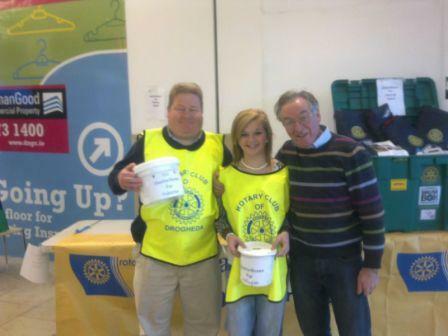 Drogheda Rotary Club held fund raising collections at Tesco 24 Hour on Saturday 2nd Oct and in Scotch Hall on the 9th of October. A ShelterBox and Tent was on display at both locations. Other fund raising events were also initiated with some local schools.